The difference between maverick and quality experiment is that quality experiment is research – which new draft excludes. Dr Margaret McCartney has a way with words. When she tweeted the statement quoted above, she cut to the core – in less than 140 characters – of one of the major problems with the Medical Innovation Bill, the so-called Saatchi Bill. The bill’s accompanying notes and publicity campaign have made very clear claims – if we pass this bill we will have a cure for cancer. 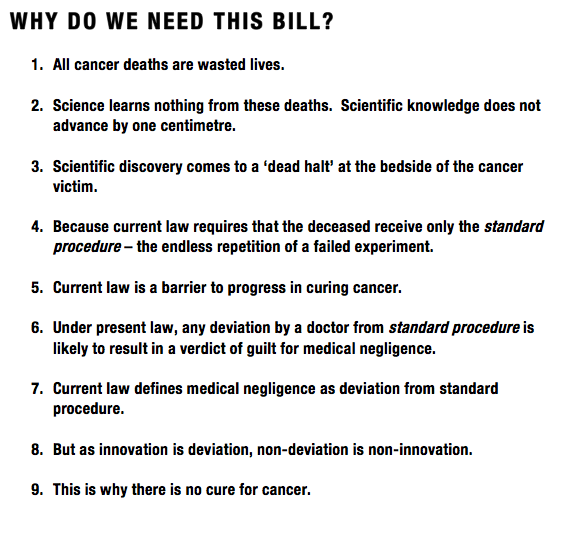 We don’t have a cure for cancer because we haven’t passed this bill yet. I’ve already covered the falsehoods about doctors being unable to carry out anything other than “standard treatment.” Here I’ll illustrate the problem with the claims about a cure for cancer by way of a rough analogy. Like Space Commander Travis, I’m always grateful for a rough analogy. In fact, I’m going to expand on an analogy I’ve used before. Claiming that by passing this bill we will find a cure for cancer, I said, is like a gambling addict claiming that he’d have won the lottery if only you’d let him buy a ticket. So, imagine that your problem is that people don’t have enough money. Rather than looking to solve this the way a government normally would try to solve it, by helping people find jobs, stimulating economic growth, redistributing wealth via taxes and benefits, you decide that the best way for people to get more money is for them to win the lottery. A very small investment, a couple of quid for a ticket, will in theory give a very large return. You immediately hit a problem: there aren’t enough lotteries for all the people who need money to enter and win. So you set about changing the law to do away with the regulation of lotteries. If more people can set up a lottery, there will be lots more lotteries, more winners, right? You can immediately see the flaws in this plan. Entering a lottery doesn’t automatically mean you will win it. In fact, there are almost certainly going to be a lot more losers than winners. Setting up more lotteries doesn’t magically solve the problem – there’s still only a finite amount of money being paid in as entry fees and therefore only a finite amount available as prizes, and you still can’t be sure of winning. Also, de-regulating the lottery industry just means that more people are going to get ripped off by fraudulent lotteries. But it gets worse. The Saatchi Bill specifically excludes the bill being used to support research. The Bill team does not wish the Bill to be used as a guise for reckless experimentation and thus, the Bill states that it may only be used in the best interests of the individual patient. But experimentation and research is the only way we can possibly find a cure for cancer. Doctors could be allowed to experiment on dying patients with novel treatments under a new bill brought by Lord Saatchi which looks set to become law. These statements appear to me to be contradictory. There has been mention, in briefing documents, that the Saatchi campaign is discussing the possibility of setting up a central register of innovative treatments. This is a laudable aim in itself, but it is not currently in the bill, and the logistical challenges in making such a central repository workable and for it to produce meaningful results from disparate treatments in differing practice areas are formidable. It’s hard enough to tease out the effects (both positive and adverse) of a treatment even when the research is carefully co-ordinated and recorded, but with the Saatchi Bill what we have is thousands of individual case studies, with inconsistent data and inconsistent rigour. Ask anybody who has run a multi-site trial what the difficulties are when you start fragmenting the data collection. But arguably this is all moot all the time the bill specifically excludes research use. As it stands, the research aspect of the Saatchi Bill is like trying to solve your economic woes by buying a load of lottery tickets, and then refusing to check the numbers. ….Those not blessed with flexible, well informed doctors supported to innovate by their institutions (the doctors who understandably don’t see a need for the bill) need to be able to investigate new things. Don’t underestimate how many hard pressed, narrowly specialist or generalist doctors cannot or will not research promising new treatments for patients. Going outside your own hospital, let alone your PCT to find a supportive doctor is very, very hard. Not least because the NHS is years away from effective information sharing. There’s also the small matter of the patient’s often rapidly declining health, plus financial and practical ability to find and visit someone else appropriately qualified. It’s all OK though. As long as doctors offer the best approved treatments. Even if they don’t read up on and bring news of relevant trials and breakthroughs, most patients will die without too many questions about their care. And the ones that do want to find out about and travel to take every last chance to survive? Well that problem solves its self….terminally…before questions about care can build up too much of a head of steam.